I recently had the opportunity to attend another Safety at Sea seminar at the Annapolis Naval Academy with some of my crew. Although I have probably taken half a dozen of these courses in the U.S. and the U.K., I always look forward to them and come out learning something new. Opening remarks, in typical fashion focused on recounting disaster stories and the people who lost their lives in various offshore races including the Fastnet Race in 1979. It is an eye opener for many people new to going offshore, as they realize how serious being away from land can be, how quickly events can deteriorate and disaster can strike. After the opening remarks and some much needed coffee, the day kicked into gear with the first session focused on care and maintenance of safety equipment. The one takeaway which I would recommend to everyone, is not just have the safety equipment on board, but to train with it as well. Does everyone know how to test inflatable life jackets and repack them afterwards? Are heaving lines and lifeslings properly faked (packed in their bags)? Have you tried throwing them to see that they come out smoothly? Do you and the crew know where all the safety equipment is? A picture can be worth a thousand words here! Later in the morning, gears shifted somewhat to focus on MOB (man person overboard) prevention and recovery. The mantra was, “Be Prepared!” Know your equipment and know your crew. Know what each of their limitations are (both crew and equipment). Do you practiced MOB drills regularly? I make it a habit to have each one of my crew members practice MOB recovery. But then, that’s me being selfish. If I were to ever fall overboard, I want to spend as little time in the water as possible! Another practice that I’ve established on my boat is a clear set of rules as to when to wear a lifejacket and when to use a safety tether. In general, if you’re uncomfortable on the water or seasick, wear a lifejacket. If the weather is rough or the mainsail is reefed, wear a lifejacket. If visibility is low due to fog or heavy rain, wear a lifejacket. And, ALWAYS wear one when sailing overnight. At least, those are the rules on my boat. 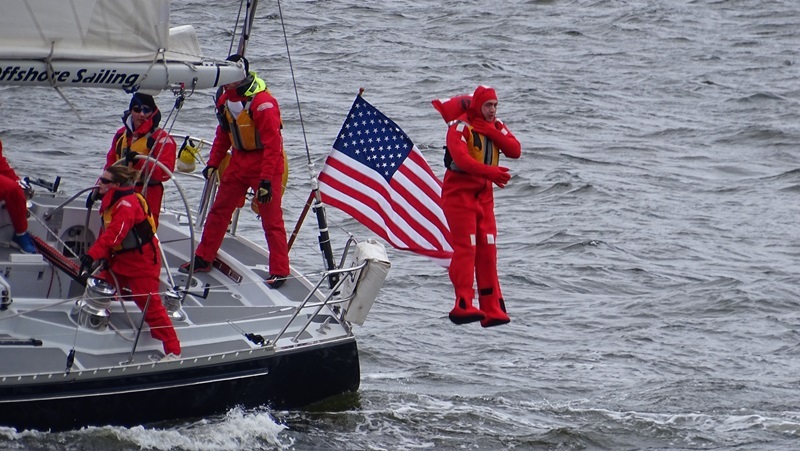 In the afternoon the Navy midshipmen put on an in-water MOB demonstration under demanding conditions: air temperature was 39 degrees, water temperature was 42 degrees and winds were a consistent 20-25 knots. Several different MOB recovery methods were demonstrated including a very impressive MOB recovery while under spinnaker. The latter was accomplished in less than 2 minutes! Later, it was back to the lecture hall to listen to two people from NOAA’s Ocean Prediction Service talk about weather awareness and forecasting. The discussion focused on understanding surface charts (for offshore sailing), identifying growing thunderstorms and squalls and steps to take both prior to taking the boat out and also while out on the water. It basically boils down to knowing the forecast BEFORE you go out and continue to monitor the weather while you’re out. 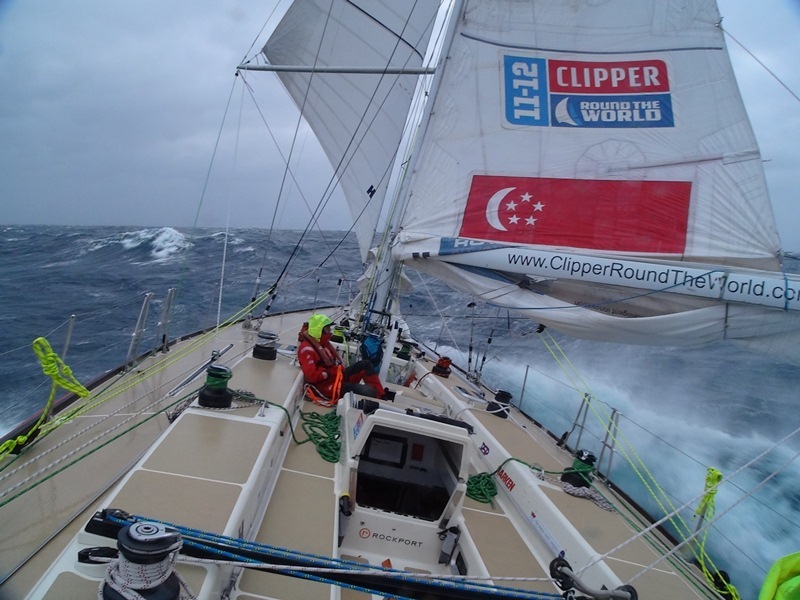 The weather discussion set the stage for the next session – heavy weather sailing. Granted, the concept of heavy weather sailing is relative depending on one’s experience. If your sailing experience has been in a protected harbor on a 24-27 ft boat then 20 knots can seem rightly intimidating. On a larger boat sailing offshore, it could be much more than that. 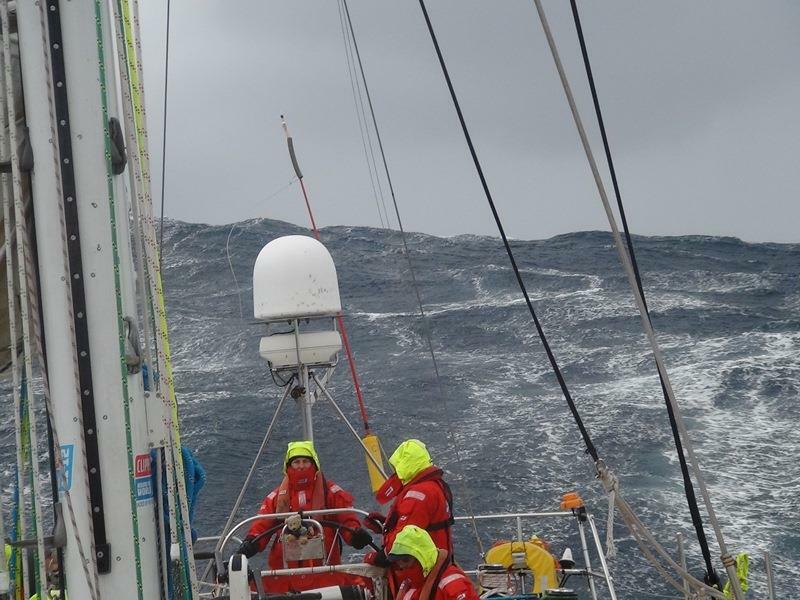 Crossing oceans, weather systems can pack a quite the punch with high winds and big seas. When I crossed the North Pacific Ocean in Winter from China to San Francisco, 35-40 knot winds with 20 foot seas and blue skies was a good day. 60 knot winds and +40 foot seas less so! Again here, preparation (read practice, practice, practice!) and having the proper equipment is key. Do you have the proper reef points on your sails? If going offshore, do you have a storm jib and storm trysail? Have you practiced rigging it beforehand? Trying to hank on a storm jib on the bow in high winds and big seas is not the time to learn. Is everything down below stowed away so nothing can fly around potentially causing injury? Is the crew prepared, meals planned ahead of time? There is obviously much more to sailing in heavy weather, but it can be “fun.” Again preparation is key! Know your own, your boat and your crew’s limitations. 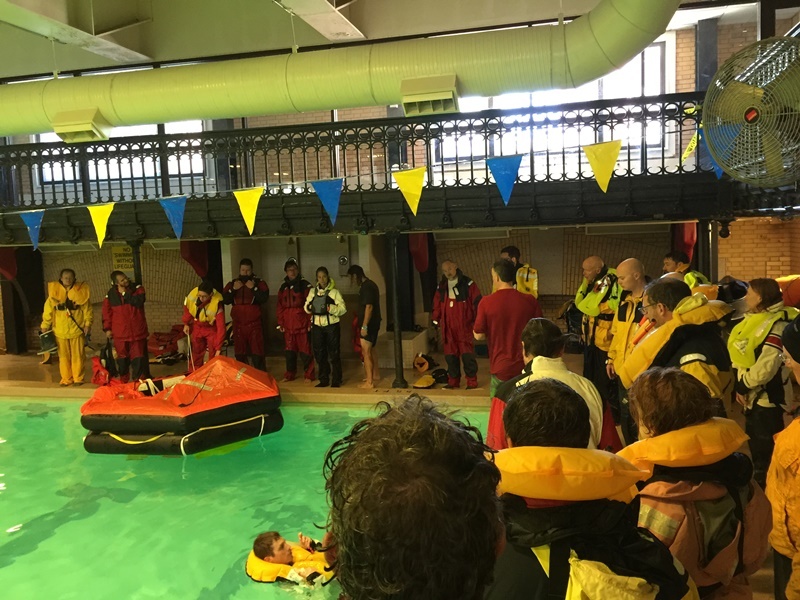 No Safety at Sea seminar would be complete without discussing medical issues and first aid. 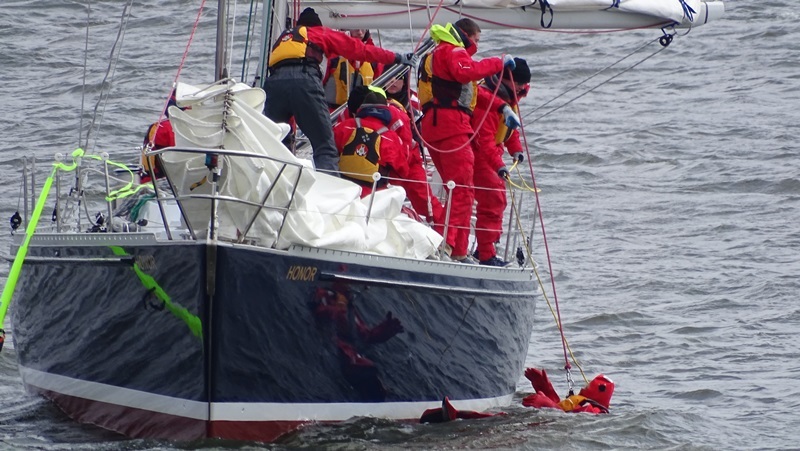 This year, the focus was on dealing with seasickness and hypothermia. Although many dismiss seasickness or mal de mer as the scourge of newbies, that is not the case. Given the right conditions, almost anyone can find themselves overcome by seasickness. After 30 years of sailing in sometimes challenging conditions, I thought I was. All it took was a bad storm several hundred miles off the coast of Japan with 50 knot winds blowing against the direction of the Kuroshio current and I finally understood what seasickness is all about! I should note that seasickness by itself is not a medical emergency. It will subside after a few days at sea – it may not be pleasant, but it will subside. However, it can lead to symptoms that do need to be monitored, chief among those is dehydration. If you or one of your crew becomes seasick, it is vital that fluids are given (and a small garbage bag by his/her bunk!). Prevention though, does wonders here. If someone is prone to seasickness, then medicine or other remedies should be administered before leaving the dock or before heavy weather hits. Underway, it can be helpful to stay on the deck and focus on the horizon. If someone is beginning to get seasick, giving him/her the helm can help significantly – provided the conditions warrant it. If it is challenging conditions you would want your better helmsperson to steer the boat. 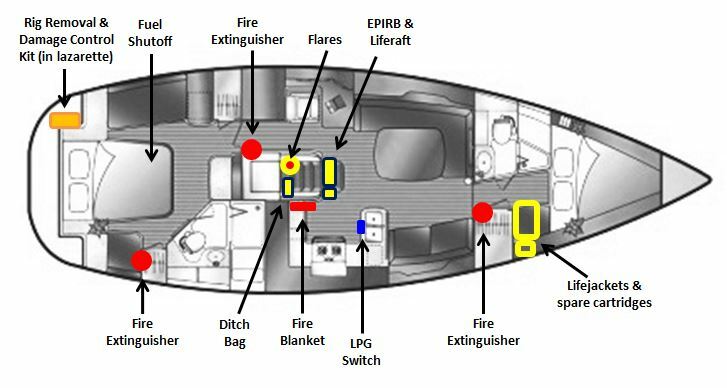 This entry was posted in Safety and tagged crew overboard, Heavy Weather, Kuroshio current, MOB, Safety at Sea, sea survival, Seasickness on May 1, 2015 by Greg Kyle (ChefonaBoat).